I am one of two Canadian members of the AIAA study group called: Road to the Space Elevator Era. I like the name. It will be a long road to get there, but once we arrive, a new era of space travel will commence. In 2004, Professor Arun Misra introduced me to the concept of space elevators, and spent the next two years supervising my Master Thesis, which entailed the first ever in-depth study of the various aspects of its mechanics. Today, some of my friends introduce me as "the Space Elevator guy". What is the Space Elevator?﻿ In short, it is a revolutionary Earth to Space transportation system that will likely be implemented by man in the mid-twenty-first century. A thin tether spanning 100,000 km connects a floating platform near the equator to a satellite that acts as a counterweight. This system remains in a stable equilibrium because the net radial forces, gravitational towards Earth's centre and centrifugal away from it, are balanced. Climbers may then scale the tether transporting payloads to space. The result, in essence, is a vertical railroad powered via solar and laser technology. 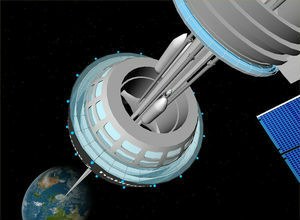 To get a real sense for how a space elevator could work, try out the Space Elevator Operator. Energy/Cost savings: Rockets are the only current method to transport payloads into orbit or into interplanetary trajectories. If any space mission were to begin with a launch from the space elevator platform, the associated energy and cost savings would be immense, perhaps a factor of one hundred. Cleaning up space: Some regions of space near Earth are cluttered with decommissioned satellites. This revolutionary system would actually allow for downwards travel of space junk. The "conveyer belt" property of having two space elevators working in parallel (one up and one down) offers a closed loop that rockets simply cannot. Energy production: With vastly improved access to space, alternative energy production methods become realistic to consider. For example, solar power beaming satellites would become cost effective. Also, mining on the moon and other celestial bodies, which contain isotopes not available in abundance on Earth, could become a feasible option. Positive international project: The scope of this project is so vast, that it would surely become an international one. A project of this magnitude could help to unite mankind, much in the way the International Space Station helps to strengthen the ties of its partnering nations.